I am not a gadgeteer. My kit is fairly basic, and I try to keep it that way. But I do have a kit, and there are pieces of equipment I find useful at home, on the range and in the field. The following list, categorized in alphabetical order, includes gear—gadgets, if you will—that’s simple and effective. For this, you do need a laptop or a desktop computer, but a good ballistics program is software you should have. There are lots of choices, and many available free via the internet, but the one I have installed on my computer is QuickLoad, which now includes QuickTarget. Together these give me interior and exterior ballistics. QuickLoad is for load development; QuickTarget is simple and easy way for analyzing and comparing trajectories with various climatic data. The two interface, and they generate the charts that appear in some of my articles. A Hawkeye Borescope is a pretty big investment, but if you really want to know what’s going on inside your bore, it’s worth it. 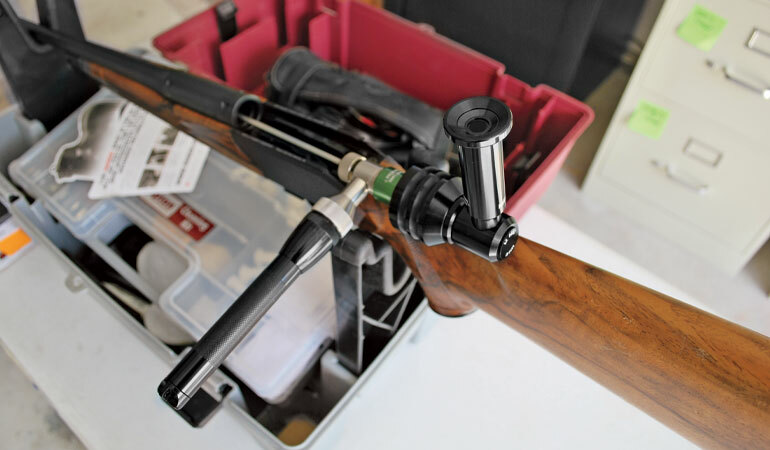 Produced by Gradient Lens Corporation (GradientLens.com), the Hawkeye Borescope is an extremely sophisticated tool that allows you to literally put your rifle barrels under a microscope. It may well reveal things you wish you didn’t know, such as erosion and pitting, but it will also quickly tell you how good a cleaning job you really did. With prices starting at about $1,000, the Hawkeye is not an inexpensive device, so while it’s almost an essential for shooters who do a lot of buying, selling and trading, it’s probably not a tool that casual shooters must have. But if you’re a serious accuracy guy, the Hawkeye will expose all the secrets of your rifle barrel. It truly is the ultimate borescope. Chronographs such as the Shooting Chrony are invaluable tools for discovering exactly how fast a particular load is going out of your rifle. When I was a kid, we had little choice but to trust ballistics tables. Today’s published ballistics are a lot more accurate than they were back then, but especially if you’re a handloader or among the many shooters today who are stretching their range envelopes, precise knowledge of velocity is critical. Therefore a chronograph really is an essential tool for serious shooters. For decades the Cadillac has been Dr. Ken Oehler’s Model 35P, which was out of production for some years but since 2010 has become available again. The Model 35P’s three skyscreens provide excellent accuracy, but what I like about it most is that it gives a printout you can save. It shows your shot string with high and low velocity, average and standard deviation. The complete 35P kit is almost $600 and is available from oehler-research.com. 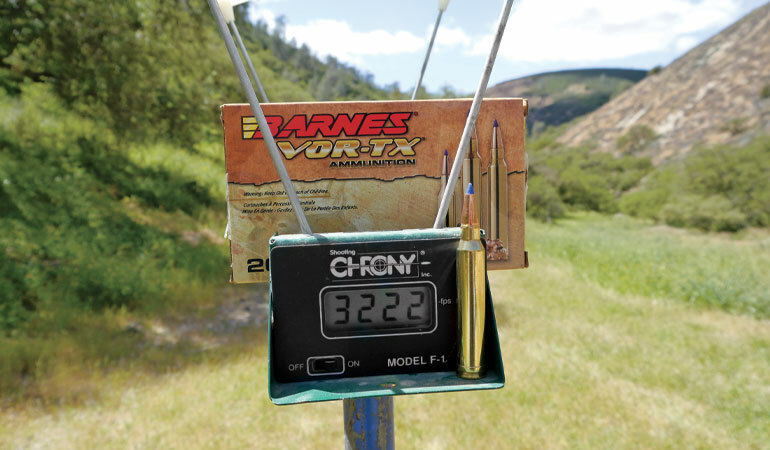 If your tastes or budget run more toward Chevys than Cadillacs, the inexpensive Shooting Chrony (Shoot ingChrony.com), with prices starting at $110, is another solution. I have both an Oehler and a Shooting Chrony and have compared them. I’ve seen minimal difference in accuracy. The Chrony is more compact, folding into a package about the size of a cigar box. The only drawback to the Chrony is it doesn’t record data or give standard deviation, but a separate printer unit is now available that does. Matches are iffy, and even butane lighters have their limitations for starting fires. The Lightning Strike is a good option for those venturing into cold climates. If you’re cold there’s nothing better than getting a fire going. When I was a Boy Scout, I always carried matches in a waterproof container. An imperfect Scout, I wasn’t always able to get a fire going with just two matches, and I found that “strike anywhere” was rarely accurate. 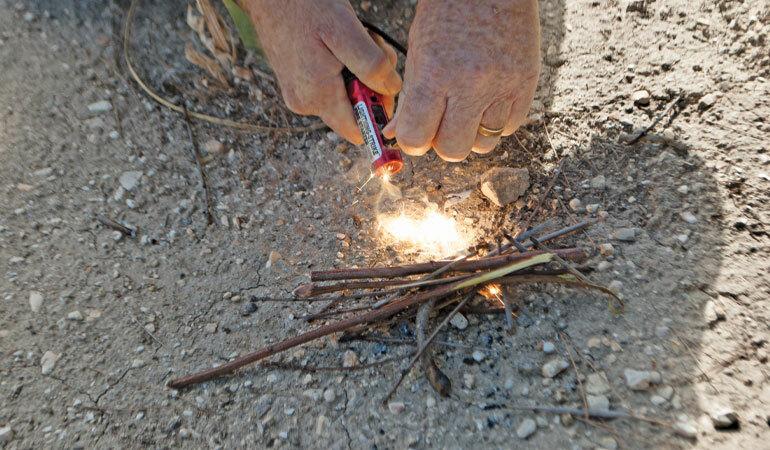 So for many years I’ve carried butane lighters instead, but then, while hunting sheep in China at 17,000 feet, our butane lighters started exploding in our pockets. I’ve been scared of them ever since. Enter the Lightning Strike fire starter (LightningStrikeFirestarter.com). Just 5.5 inches long, about the same size and weight as a duck call, the rear of the barrel contains wafers of tinder. The forward portion holds the ferro rod and directs the sparks. Lord, does it spark, but it’s also completely inert and safe until you apply the striker. I just got this gadget at the Safari Club Convention, but I took it out in the backyard and instantly started a couple of fires. It’s going in my pack from now on. Today it’s fashionable to call a flashlight an “illumination tool,” and lights certainly have come a long way from the old metal D-cell Evereadys. I’ve been using the Journey 160 flashlight from HybridLight (HyrbridLight.com). While HybridLight products can be quick-charged from an outlet, they store energy from an integral solar panel. No batteries. Although not as compact as many modern flashlights, it is lighter than most. Mine delivers 160 lumens with up to 25 hours of light on a full charge, yet it weighs just six ounces—and I don’t have to worry about carrying spare batteries. Also, the quick-charge port on the back sports a USB port as well, so you can charge your cellphone from it. The Journey 160 is perfect for vehicle, range bag and pack and is just $35. I believe in rifle slings, but the reality is that even the most non-slip among them will slip off your shoulder, especially on uneven ground. Pack straps tend to make it worse, so most of the time one hand stays glued to the sling. There are lots of reasons for true hands-free carry: You’re lugging, say, spotting scope plus tripod; you’re using hiking poles (like we all should); or you’re just hiking and a shot isn’t imminent. There are numerous options. Many packs designed for hunters have pouches and straps designed to secure a rifle. For those that don’t, the Gun Commander from Crooked Horn Outfitters ($75, CrookedHorn.com) combines a quick-release waistbelt attachment and a hook that goes on top of a shoulder strap. I’ve used it on tough backpack sheep hunts, and it secures the rifle no matter how rough the terrain yet allows rapid access. Another option is the new RifleJok ($45, RifleJok.com) harness. It essentially turns your rifle into a backpack, holding it secure and vertical on your back. It works perfectly when you aren’t carrying a pack, but the straps are long enough to use with a daypack. Rangefinders, especially those with inclinometers, are indispensable for many hunting situations, and wind meters give you a good start in figuring out where to hold. I do a fair amount of mountain hunting, and figuring out how to adjust for an uphill or downhill angle is one of the most vexing problems in riflery. Therefore, I prefer carrying a rangefinder with an inclinometer, one that measures the angle off the horizontal and gives you the adjusted range. Leupold (leupold.com) was first to market this feature, and its TBR (True Ballistic Range) models start at $300. The new TBR/W models also perform wind corrections. SIG Sauer’s Electro-Optics Kilo series rangefinders also have the inclinometer feature. SIG calls it AMR (Angle Modified Range). This line continues to expand, with the new top-of-line 2400 ABS ($1,800, SIGsauer.com) offering ranging up to two miles. It has the AMR feature, and it comes cased with both tripod adapter and wind meter. Lots of people, including me, have difficulty mounting scopes. Much of that can be alleviated with the right tools. I have a Wheeler Professional 72-piece screwdriver set ($60), and while I don’t profess to know what all the different bits are for, over the years I’ve used most of them. I also have Wheeler’s FAT torque wrench ($45), an awesome tool that allows getting proper tension without overdoing it; over-torqueing can damage your scope. Wheeler tools are sold by many major sporting goods retailers. I don’t carry the Wheeler set when I travel. For that I turn to Leupold’s mounting tool ($24), which features bits for the most popular scope screws. It goes in the gun case, as does the Gun Tool from Real Avid ($25, RealAvid.com). Designed specifically for firearms, it contains about 18 tools, including Torx and Allen wrenches, hex bits and more—even a choke wrench tool for shotguns. It’s been stumped a couple of times, but not often, and there are now upgraded models with even more goodies, plus an AR-specific tool. I carry the Gun Tool just about everywhere. I love to lie down and shoot over a pack, but that doesn’t always work, and I like to keep my options open. Three-legged shooting sticks are almost universal in Africa because thorns and low vegetation usually preclude a low shooting position. I’ve used them so much over there I carry them almost everywhere. In hilly country I tie the legs together tightly to use as a walking stick. I prefer sticks that break down, not only so they’ll fit in a gun case, but also, shortened, they can be used in sitting and kneeling positions. African Sporting Creations (AfricanSportingCreations.com) offers models from traditional wood to high-tech carbon fiber. Also new is the Super Compact ($350), which breaks down twice, is easier to pack and capable of being used in prone as well as in sitting or standing. In more open country, it’s hard to beat lying prone over a bipod. The gold standard in this world is the good old Harris Engineering series (HarrisBipods.com), sturdy, well-made and inexpensive (starting at $74). The only drawback to most bipods is they’re fairly heavy, and the models that slip over the forward sling swivel stud are slow to attach and detach in the field, so most of us who use them leave them in place. Spartan Precision Equipment makes the new Javelin line (JavelinBipod.com) of extremely light carbon-fiber bipods starting at $250. The base is installed on the forward sling swivel stud. The legs are separate and attach via a super-strong magnet so you can carry the bipod on your belt and, if circumstances dictate, slip it into place in seconds. With the variable of distance effectively solved by rangefinders, wind deflection is now the greatest variable and barrier for shooting at longer ranges. There are lots of simple wind meters out there, but here, uncharacteristically, I’m going to recommend the high-tech solution. Get a wind meter that attaches to the microphone jack on your mobile phone or tablet, then go to the app store and download the matching ballistic app. The Ballistic Windmeter from Nikon ($40, NikonSportOptics.com) is inexpensive, mates to the company’s Spot-On app, and, yes, even computer Neanderthal me found the app readily. 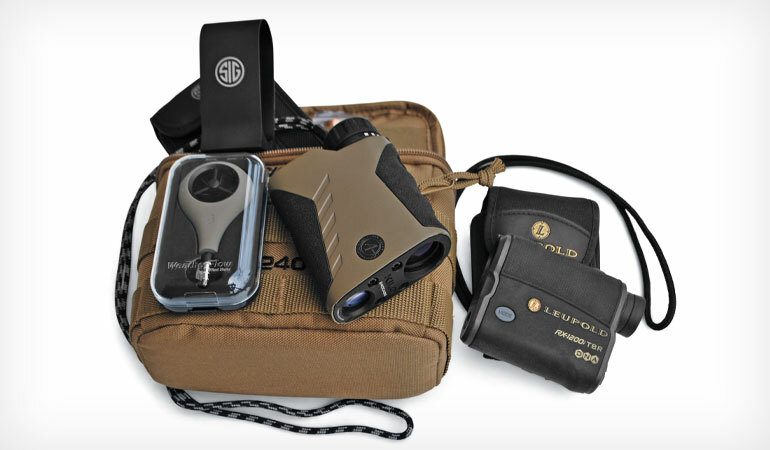 The SIG Sauer Electro-Optics 240 ABS rangefinder comes complete with a cellphone-compatible windmeter as well as a tripod adapter for the rangefinder. The SIG system mates to the Ballistic Solver app. The best way to get better at reading wind is to make a guess and then check actual velocity with a wind gauge. 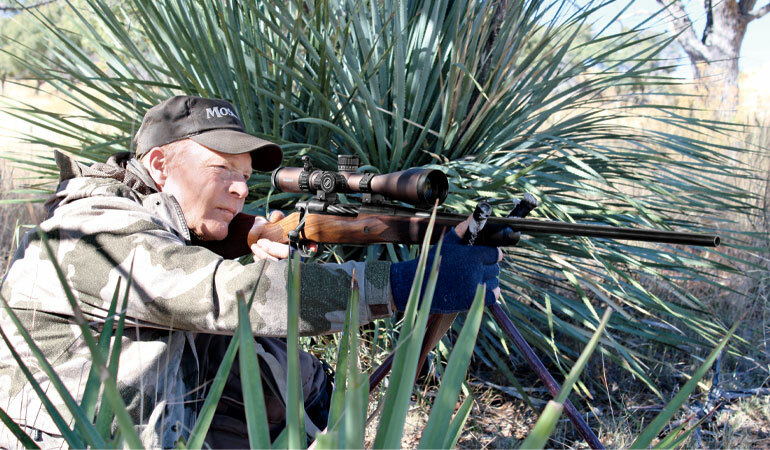 With practice most of us can come close enough for shooting at medium ranges, but for long-range shooting, you have to know to make first-round hits. At this moment we can only measure wind at the shooter. What we need now is a gadget that will measure wind at the target—and at points between target and shooter—but that lies in the future.